As I walked Ashley Reservoir the other day, these 3 words kept circling through my mind. Be. Here. Now. Despite the ever present To Do List running through my mind, this thought helped me relax into my walk and embrace the beauty around me. I used some plywood pieces leftover from the Family room build, as the bases for each word. Corrugated cardboard rescued from recycle bin, denuded and cut into letters. I like the dimension of them, what do you think? I painted front surfaces black, then glued newspaper to the edges, and used bubble wrap, rubber stamps, acrylic paint and textured paint for a layered look. 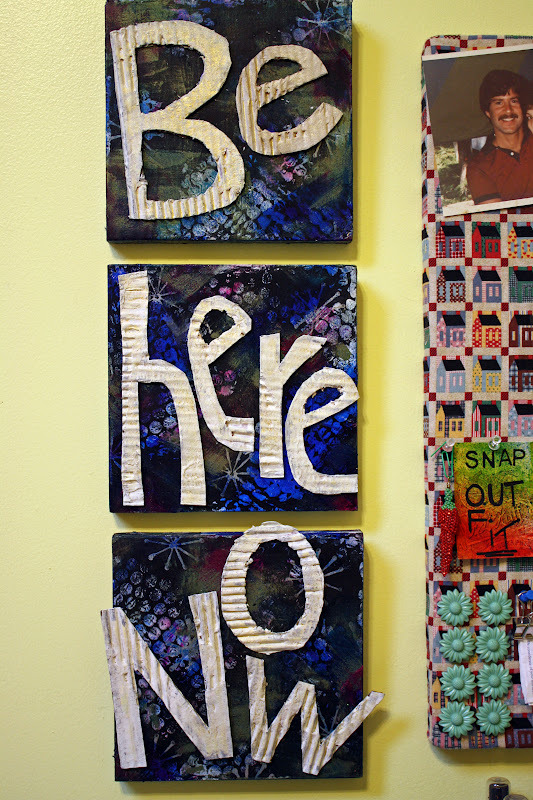 Next to my bulletin board, in the mustard studio, is where "Be here now" hangs. What messages are circling 'round in your mind right now? Just be sure to say nice things to yourself, because you are amazing! mmmm.... yes! Love the phrase. Distractions take away from our just 'being in the now' and this is a good one, Donna! Like your paintings, they came together wonderfully. you make it look so easy with all of the photo angles! love your BE HERE NOW mantra and so glad that you were listening.. i'm listening, too! It's gorgeous Donna. I agree that we should always be kind to ourselves. So what did I inspire you to do for your Halloween party?